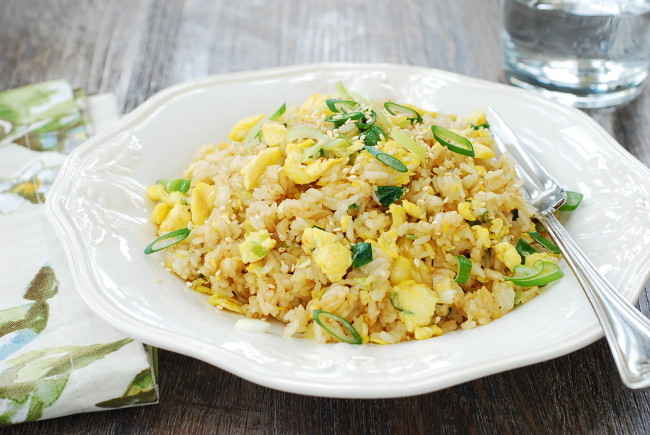 This egg fried rice is flavored with lots of scallions. It’s a quick and easy way to whip up a light meal and use up leftover rice and eggs. The key to this recipe is the oil flavored with scallions that’s used to cook the eggs and fry the rice. It gives this simple dish a nice flavor. To keep the eggs soft, first make scrambled eggs that are a bit runny, remove from the pan, fry the rice, and then add the eggs back to the pan to combine with the rice at the end. The eggs remain nice and fluffy this way. If you want to add any other protein such as shrimp, chicken, beef, etc. to the fried rice, separately cook them and combine with the rice and eggs at the end. You can also fry frozen peas or finely chopped carrots with the rice. I added some shrimp in the photo above. Use day old rice. If the rice is a bit too hard after being in the fridge, heat it up in the microwave to soften it a little. If you need to make fresh rice for it, make it slightly drier by using a little less water than usual, fluff it up, and then leave it out to cool and dry out a bit. The scallion scrambled eggs are also great on their own as breakfast or as a quick side dish to any Korean meal. Crack and beat the eggs in a bowl with chopsticks or a fork. Heat a large skillet over medium high heat with 2 tablespoons of oil. Add 2/3 of the scallions, and stir fry until the scallions turn soft and fragrant. Reduce the heat to medium low and add the eggs, and gently stir to scramble until the eggs are set but still a bit runny. Transfer to a plate. Turn the heat up to medium high. Add 2 tablespoons of oil, and stir in the remaining scallions until the scallions turn soft and fragrant. Stir in the soy sauce. Add the rice, and fry the rice, stirring well and breaking up the clumped up rice. Return the eggs to the pan and mix well with the rice. Add salt and pepper to taste, sesame oil, and sesame seeds.